Charles B. French Official Site: How I Met Your Mother: "Tick, Tick, Tick." Quick Review: Not the most fun episode of the season. It wasn't bad, just very, very complicated. Spoilers ahead, so watch the episode before you proceed. Best Episode Moment: Anything with Sandy Rivers. That guy's a hoot. Best Character Moment: Kevin telling Robin why he likes her. Worst Character Moment: Barney telling Robin why he likes her. Best Character Interaction: Ted and Marshall on the most harrowing journey of their lives. Worst Character Interaction: Barney and Robin. Every last moment. Best Character Progression: Robin choosing to be with Kevin over Barney. Worst Character Regression: Ted trying to pull Marshall back into their college bro days. Best Manifestation of Guilt: The "tell them right here on this boat" song. Best Reveal: Ten and Marshall's harrowing journey lasted a whole two minutes. Did the theme work? 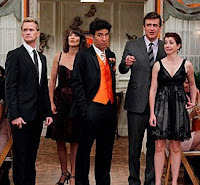 I like the idea of time being relative, and all the time moments in the episode worked, especially Barney's long second. Any hint about The Mother? She's either got a pretty high tolerance for users of "sandwiches," or she's so perfect that she makes her own. Do we like Ted this episode? Ted's the single guy still trying to hang out with his married bro. He was amusing but also a little sad, what with trying to recapture his and Marshall's sandwich infused college years. Overall Opinion of the Episode: So we had a lot going on this week. Barney and Robin wake up in bed together and now have no idea what it means. If you think you've seen this before, you have. Back in season three. That time they were worried about Ted's feelings but were themselves single. This time, they cheated on their significant others and spend the episode figuring out how to confess. Sadly, this go round wasn't as effective or compelling as last time. Let's start with Nora. This season she hasn't been a character so much as a plot device with a lovely accent. Nazanin Boniadi does a great job, but her character is ultimately one dimensional. We're still not sure why she even took Barney back in the first place, especially since she should have headed for the hills back when Barney told her all the bad things he's done to women. As such, while the pain Barney experiences having to confess his cheating to Nora is real, we were never really attached to the relationship in the first place. I did like seeing Barney's character growth because of it, but again, that's because it was really no more than a plot device. I wonder if the writers felt the same way and just decided to toss Nora because they didn't know what to do with her. Kevin is a better character, so if there's one person I feel for it's him. Then again, he met Robin because she was trying to sabotage Barney's relationship. He knew, from the very first hour, that she had feelings for Barney. Given that he's commented on the fact that Robin's friends are way too close for their own good, he shouldn't be surprised when he finds out what happened. In fact, it's possible that he already knew what had happened, but rather than throw the relationship away, he realized what he was getting into and decided to double-down. If there's one bright spot in this whole debacle, it's when Robin asks Barney and Kevin the same question. "Why do you like me?" Their answers were telling. Barney only saw her as being almost as messed up as he is, while Kevin saw something more, something worth investing in. With Kevin, he was well aware of the baggage, but he sees how great Robin in and he wants her to see it too. I think Robin realized that while Barney is well intentioned, he'd only drag her back down again. Barney's been on an interesting arc, and I do like it. He's such a great character that he can only be improved with personal growth, as illustrated by the two episodes with his dad last season. I think this experience, as heartbreaking as it is, might lead him somewhere better as a character, especially since he's supposed to get married a little ways down the road. For that to happen, the writers need to realize that the old Barney needs to vanish completely, and instead we need a new Barney. That Barney can still be awesome, he should be, but the kind of awesome a woman would want to marry. That's what I want to see, not another retread of Barney pining for Robin. If he and Robin do get back together, it should be for something real and meaningful, not contrived. Let's get to Ted and Marshall. The first time I watched it, their whole epic journey in search of nachos was annoying. However, realizing that the "epicness" of said journey was just a result of them being stoned out of their gourds actually improved my second viewing, as I picked up all the subtle details. The not-so subtle details I liked were everything to do with Sandy Rivers. From his blatant product placement to even more blatant sexual harassment of his intern, he's always a bright spot, and I'm glad they brought him back. I think my favorite line was his revelation of what was in the gift bags. And this leads me to my last point. Ted's telling this story to his kids, and it's about Uncle Barney and Aunt Robin cheating, Uncle Marshall and their dad getting stoned, and blatant sexual harassment on a boat. Either these kids are going to be super prepared for the real world, or perhaps Uncle Kevin is about to get a lot of new business. Sorry... I actually rather liked the Barney/Robin, until it blew up. Barney had better lines than Kevin, actually, aside from the mess comment. Barney may not have been gooey there, but he was honest. End of season 6, Barney was thinking about Robin a lot. Remember those imaginary chats with his dad about how he was never happier than with Robin? “I am constantly amazed by the things you say, entranced by the things you do, and unlike a certain coconut jalapeno martini, you’re easy on the eyes"
Sorry, but I don't think that's romantic. I think that's high school crush goggles, the "ooh she's pretty and magical!" ideal that no woman can live up to. Also, Kevin of all people should know that Robin, much as I love her, does have issues. I heartily agree with you about this episode . . . especially in regard to the Barney/Robin relationship. The writers should have allowed it to remain dead after Season 5. The romantic chemistry between them tends to leave a hollow feeling in my stomach. I realize that Nora was a one-dimensional character, but I still ended up liking her. Even Nazanin Boniadi had better chemistry with Neil Patrick Harris than Corie Smulders. My sister actually pointed out what I found wrong about Barney and Robin . . . their romance felt forced.